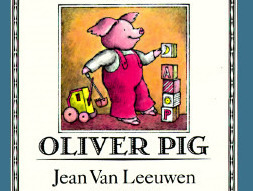 The everyday adventures of an anthropomorphic pig and his little sister. Oliver and his little sister Amanda bake oatmeal and raisin cookies with their mother (which we will sometimes bake after reading the story); squabble over sharing issues but eventually make up; welcome their grandmother for a visit; take ages to get ready to go out into the snow; and, in the last story, Oliver has a long and funny conversation with his father before going to sleep. Like the Bullerbyn series, I loved this book so much growing up. There are a lot of similarities: the stories concern small, everyday adventures; the adults treat the little ones with respect; and there are small disputes which are realistic, but ultimately resolved. To a city-kid like Lee, the Bullerbyn series is somewhat escapist: it is, after all, a farm filled with cute animals, and the kids are somewhat older and get to do lots of things by themselves which are fairly unthinkable to her...like going over to an island without adult supervision (and even walking home from school by herself is going to be out of the question for a long time). Oliver and Amanda, however, are very real to her. Oliver loves dinosaur books and cookies and is in the same sweet-but-sometimes-bossy phase as Lee, so she identifies with him a lot. Oliver and Amanda's parents are very important to the stories, and I love how they treat their children - there's just so much love in the Pig household. When Amanda wants to help with the cookies, she isn't told she's too little; Mother Pig lets her be part of the action in an age-appropriate manner. When Oliver squabbles with Amanda and takes away her book, his father doesn't scold him harshly or force him to share - but he does gently ask Oliver to examine his behavior; the strategy works and Oliver soon shows Amanda how much he loves her. Grandmother Pig too takes the time to genuinely appreciate the (invisible) meal Oliver has cooked her as a welcome gift. As a mom I especially like the story about the kids and their winter clothes. Mother Pig helps the piglets get ready to go out in the snow, which turns out to be a time-consuming and slightly nerve-wracking ordeal - and once Mother Pig gets dressed herself, the kids just peel off their winter clothes while her back is turned (not out of menance, but simply because they were hot). Mother Pig ends up crying - but Oliver and Amanda comfort her using the same words and gestures she had used to comfort Amanda earlier. 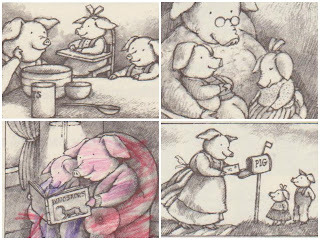 So many kids' stories present parents and adults as distant figures of authority (or ones of ridicule), but Mother Pig's reaction to these everyday frustrations is just so real. I enjoyed the author's backstory on the books as featured on her website. Oliver and Amanda are based on her actual children, and she started writing these stories during naptime (something I can symphatise with since I sometimes worked from home when Lee was tiny; it really made me appreciate the days at the office!). Before researching this book, I had no idea there were more of them - I can't wait to read the others. The pictures are scans from my copy - Lee would like to clarify that I was the one who colored in that one picture 20-odd years back.